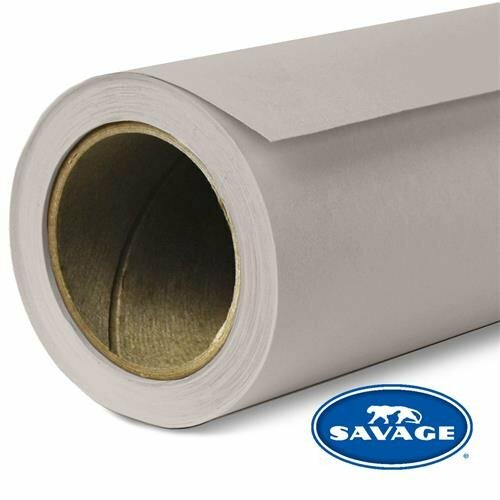 Savage has been one of the top choices for studios and sets with their classic, cost-effective Widetone Seamless Background Paper, available here in Storm Gray on a 140 in. by 105 ft. roll. The fine-tooth, non-reflective surface is ideal for creating smooth, even backgrounds in portraits, commercial photography, videos, and more, as well as other applications such as theater, event decorations, banners, and temporary video projection screens. The paper itself is high quality material, with a basis weight of 100 lb, or 145 gsm, and an easy-to-handle thickness of 7.6 mil. Widetone comes wound on a core with a 2.125" interior diameter and is wrapped in a plastic sleeve for protection. It is recommended to be stored vertically and may require clamps to secure on a backdrop stand. Additionally, it is both acid-free and 100% recyclable.